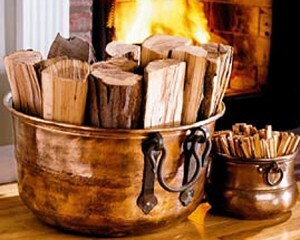 Wood for burning in a wood stove must be “dry” to burn with maximum efficiency. “Dry” means the wood must be aged, so it is not “green,” and also not “wet” from rainwater. When a tree is cut down, the wood is “green,” or saturated with water through the normal capillary action needed to keep the tree alive. Depending upon the exact tree specie, it can take well over six months of normal storage for the wood to “season” and no longer be “green.” If you harvest your firewood in late summer or early fall, you can cheat and speed up the seasoning process. Tired of your heat going out the chimney? If you are looking to get the most possible heat your fireplace is capable of, then a stove or fireplace insert might be just what you need. A masonry fireplace is about -15% efficient on average, sucking out more heat than it can produce. A fireplace insert will improve your efficiency up to 65%, and some inserts will exceed this. Let’s take a look at some of the reasons why adding a fireplace insert improves the overall efficiency of your fireplace. For starters, a fireplace insert is designed like a wood stove, air tight and used with the door shut. Your living room is no longer losing mass amounts of heated air up your chimney. Also, inserts have an air draft control. For this reason you get a more controlled burn, where energy and money is saved while creating less emissions. No more heat shooting up the chimney because you are unable to control the amount of combustion air your fireplace is receiving. Another great feature is that most inserts have a powerful fan system. Some consist of one or more blowers, with some systems that are thermostatically controlled and heat activated. Talk about efficiency! Whether your project is commercial or residential, Forever Young will provide you with a quality fireplace insert or wood stove and expert, to code, installation. Contact us for a evaluation of your fireplace, estimate and design consultation. Whether your project is commercial or residential, Forever Young will provide you with a quality, environmentally minded, cost effective solution. ~ Basement waterproofing cost, what is fair? Most people probably never hire a basement waterproofing contractor and the few that do have a hard time determining what a fair basement waterproofing cost would be. In order to determine that you have to consider many factors. Some of these are obvious so bear with me.